history of their region. In early years he worked at freighting in order to support his family, making the trip between Westerville and Grand Island. On these journeys he carried a "grab box," which Mrs. Hays always filled with good, palatable food. Each freighter carried his own blankets and slept on the floor of the house at the end of the day's journey. They always cooked their own meals on their host's stove, the family remaining in bed until the freighters had eaten and gone. In Grand Island they slept in a hay mow and dined sumptuously at a restaurant. Mr. Hays has been a member of the Masonic order since he reached his majority in Illinois, and transferred to Ansley on coming west. He is prominent in social and fraternal circles, being a member of the Royal Highlanders, as well as the Masonic order. In politics he is a democrat. But two children were born to Mr. Hays and wife; their daughter died in Broken Bow, April 8, 1889, she at that time being a teacher in the public schools and a young woman of high character and refinement, who had many friends. The son, Frank M., has a fine farm consisting of a half-section of land adjoining his father's place on the south. He was born in McLean county and brought to Nebraska in childhood. He is a prominent farmer and stockman, as well as an enterprising and useful citizen. He was married at Westerville, Custer county, March 9, 1899, to Alice Baker, a daughter of Mr. and Mrs. Thompson Baker, of Custer county, and their union has been blessed by three children: Harry, Vernon, and Esther. Deer and antelope were plentiful in 1883 in the vicinity of Mr. Hays' farm. He killed three October 25 of that year; the snow being knee deep to a horse, it was easy to trail and bring down a deer, which were dragged home tied to the horses tails. Wolves were easily run down and killed when the snow was deep. January 12, 1888, the day of the blizzard, found Mr. Hays, like many others, on his way to a sale. When the storm broke he mounted his horse, stopped at the school house and instructed his children to remain in town, and let the faithful animal take him home, which it did at breakneck speed. With one eye covered with ice, the horse found the way through the blinding snow to the door of the barn, more by instinct than sight. In 1894, the dry year, only a few oats were harvested, which the hungry pigs devoured the day it was cut. Mr. Hays and family lived in a dugout on their claim some ten years before building a large "soddy." Their stable, cow shed, hog house and other outbuildings were all built of sod, as well. A neat, frame cottage now replaces the primitive dwelling, and a big red barn has displaced the sod shed. A view of the present home, with a sketch of the old "soddy," are to be found on another page of this work. Residence of Marion G. Hays. Frederick L. Wanser, youngest child of William Wanser, was born at Peoria, Illinois, June 26, 1864, and spent the first years of his life, in and near Peoria, and in Livingston county. When the family migrated to Nebraska in the fall of 1871, he came with his mother by rail to West Point, where the family resided for three years and then settled on a homestead two miles northwest from Plainview. Here he grew to manhood in the open country, developing all the sterling, self-reliant traits of the west. In 1888, with his father, he engaged in the drug busness [sic] in Plainview and continued in that until 1894, when they disposed of their store, the son entering the real estate business in which he has engaged since that time. Mr. Wanser was married in Creighton, Nebraska, December 10, 1890, to Miss Mary A. Rothwell, who was born about forty miles from Providence, Rhode Island, a daughter of James and Jane (Griffith) Rothwell, the former dying at Creighton, at the age of seventy years, the latter dying January 9, 1911, in his eighty-fifth year. Mrs. Wanser did not come west with her parents, remaining until 1882 to complete her education in the Ashaway High School. Three children have been born to Mr. and Mrs. Wanser: Elsa, a graduate of Plainview High School class of 1910, and since a teacher of the Pierce county schools; and Sterling, and Byron. Mr. Wanser well remembers in coming to Pierce county meeting earlier settlers getting away, among them the venerable William Alexander who had been discouraged by the raids of grasshoppers for the past few years, but who later returned to his Nebraska homestead. Such incidents were not calculated to give newcomers much enthusiasm about the prospects of the west. But the present marvelous development has justified their faith in what was then the far west. Mr. Wanser has experienced the many exciting phases of pioneer life, such as prairie fires, and blizzards. In the memorable storm of 1888 he was on the hay flats a mile from home, but made his way safely home through the icy mist. The barns were so completely filled and covered with snow that for six weeks the horses could not be removed, water and feed being carried to them through the window. Mrs. Wanser, then residing in Creighton, remembers the citizens coming to the rescue of the children at the village school and taking them home in relays until all were safe beneath the family roof. She was teaching in the schools there at the time, and had taught at Bazile and East Branch prior to that time. Mr. Wanser is a republican, and a member of the Knights of Pythias lodge. teen feet in height. He assisted William B. Chilvers in planting the ash sprouts that now form his extensive ash grove and also the cottonwood now forming the beautiful forty-acre grove on his timber claim. During the first years in Nebraska, Mr. Wanser has seen as many as seventy-five antelope in a herd and as many as thirty deer in one day. One of his most uncomfortable experiences of pioneer days was on a deer hunt. With a companion, on a wagon they were following a herd of deer to the south of the settlement, and finding progress too slow, unhitched and followed on horseback. The deer they killed was too heavy to carry on a horse so they were compelled to return some miles for the wagon and go back for their game. On reaching home that night about nine o'clock, he found his heels and toes frozen so severely that it was many months before they ceased to give him pain. The early church services were something unique, reminding one of Puritan days. Mrs. Wanser relates of Mr. Wanser's attending services of one of the pioneer preachers that lasted from early morning until late in the afternoon with no intermission for refreshments, and adds that he is much less devout now-a-days. It is good for men to have passed through the trials and hardships of pioneer days; it gives them a greater appreciation of the comforts and benefits of the present day in this western land of plenty. Albert Leuthaeuser, one of the younger members of the farming community of St. Libory precinct, is a gentleman of progressive ideas and a worthy citizen of his section, his every act standing for the best interests of his county and state. He is in many respects a thoroughly self-made man, and is a true representative of a family, well-known for their education and refinement. Mr. Leuthaeuser is a native of Nebraska, born in Merrick county, January 22, 1876. He is the eldest in a family of four sons born to his parents, Rev. August and Metta (Damman) Leuthaeuser, two of his brothers now residing in this state and the other in Montana. His father and mother are now residents of Concord, Dixon county, Nebraska, where the former is pastor of the Evangelical Dutheran [sic] church. The family were pioneers in Merrick county, moving from there to Stanton county when Albert was about one year of age, and when he was five they went to Norfolk, remaining another five years. From there they came to Saunders county, which locality they made their home for fifteen years. Our subject started for himself when he was in his twentieth year. At that time he was married to Mary Koch, who was a native of Germany, coming to Saunders county with her parents when she was a small child. The young couple settled on a farm in Saunders county and began in the stock business, Albert buying stock for shipment as well as having quite a herd on his farm, and raising some grain, and other farm produce. In 1904 he purchased the old Martin Jensen farm which is situated in section ten, and fourteen, township thirteen, range nine, and consists of two hundred acres of fine land. The farm is improved with fine buildings of all kinds, equipped with every convenience for modern farming, and is one of the show places of the neighborhood. To Mr. and Mrs. Leuthaeuser have been born, six children, namely: Helena M. W., Martha E. M., Esther H. A., Ruth E. A., Martin A. C., and Walter, and they form one of the most interesting family groups to be met with in many a day. They have a happy and congenial home, and are well liked by all who know them. Prior to his demise the gentleman whose name heads this personal history resided on his estate on section ten, township nineteen, range fourteen, Valley county, Nebraska, and was well known throughout this locality as a successful and prosperous agriculturist, ever active in all pertaining to the upbuilding of his home state and county, and always taking a keen interest in all lines of advancement. Daniel Cooley Bailey was born November 15, 1820, in Canada, where his parents who were New Yorkers, were visiting at the time. On April 6, 1845, he was united in marriage to Miss Suzan Alzina Dale, and Mr. and Mrs. Bailey were blessed with four children, whose names are as follows: Mary, George, Harry, of whom a biographical writing appears on another page of this review; and Frank. Mr. Bailey and family moved from New York state to Wapaca county, Wisconsin, in 1855 or 1856, and came on west to Valley county, Nebraska, in 1872; they drove overland from Wisconsin and reached the site of their homestead September 3, 1872, after camping five weeks on the way. Mr. Bailey was one of the first county commissioners of Valley county, and in the years that followed he was one of the active upbuilders of Valley county. The Bailey home was the scene of many of the first incidents that went to make up the growth and development of Valley county before that county was organized. Here was held the first church service and the first commissioners' meeting. This was before Fort Hartsell was established, when all was a wilderness to the north and west. died May 10, 1907, and his good wife, Mrs. Alzina Bailey, passed away October 26, 1908. They will ever remain dear in the memory of those who knew them, and at their death they were deeply mourned by a host of sorrowing friends and relatives. In reviewing the early history of Nebraska, those who have actually experienced the glorious successes of that golden state may perhaps look upon this sketch as inadequately portraying the incidents connected with its growth and upbuilding, but in the memory of the gentleman whose name heads this sketch, who is one of those typical pioneers and representative westerners, eacli event of success and failure through which he has passed stands out vividly and will remain so during the entire course of his life. Mr. Brosh was born in Michigan, in 1872. He is a son of Frank and Lizzie Brosh, both natives of Bohemia, who came to the United States during the early part of their married life and settled in the eastern states. They crossed the Atlantic in a sailing vessel, the trip consuming several weeks, its passengers suffering the usual discomforts and hardships on the journey, but finally landing in safety, although there were times when all felt they might not again see land. However, they reached port in New York, and Mr. and Mrs. Brosh went directly to Michigan, where they settied on a homestead which they occupied for many years, their first dwelling being a log house and their furnishings of the most primitive sort. Their children were born and reared there, the father working for the most part in the lumber camps, where also our subject was employed as soon as he became old enough to shift for himself. In 1882 Mr. Brosh emigrated west, arriving in Madison county, in the spring, where he bought a tract of land from Mat Clouse, which he rapidly improved, engaging in the stock and grain raising business, and through thrift and perserverance was soon counted among the prosperous and successfull men of his section. He has a good farm and a comfortable home in Kalamazoo township, where he is highly esteemed by his fellowmen, and during his residence here he has given freely of his time and money in promoting the good of the community. Mr. Brosh was married January 2, 1891, to Miss Mary Dorweck, who is a native of Wisconsin, and to them have been born four children, as follows: Mary, Rosie, Adolph, and Frank. Charles Edward Ross has been a resident of Custer county since he was brought there by his parents in 1874, In early childhood. He was born in Jasper county, Iowa, December 18, 1869, and was the youngest child of Jacob H. and Catherine (Baker) Ross. Jacob H. Ross brought his wife, with their two sons and four daughters, from Iowa to Custer county in the summer of 1874, taking a pre-emption on the northeast quarter of section seventeen, township nineteen, range twenty-one, later taking up the land as a homestead. His son Wesley came to the county some years later. The Ross family were among the first settlers on Victoria creek and have been closely identified with the development and upbuilding of their part of the county since they came there. Mrs. Ross died on the homestead farm September 14, 1900. The only members of the family now living in the county are Mrs. George Carr, of Broken Bow; Robert D. and Charles Edward. Wesley Ross, also a pioneer settler of Custer county, now resides in Oregon; Eliza, Mrs. Thomas Prosser, lives in Missouri; Annie, Mrs. George E. Carr, is mentioned above; Lizzie, Mrs. Judson Hawks, lives at Norwood, Colorado, Robert D. Ross and family live in the county; Mrs. Tina Cooper lives in Oklahoma. Robert D. Ross was born in Iowa and came to Custer county with his parents in 1874. He married Miss Ida Belle Merchant, daughter of an early settler, and they have four sons and two daughters. Charles E. Ross was in his fifth year when brought by his parents to Custer county, where he grew to manhood. He has since then lived on his father's homestead, which he now owns and operates. He married Rebecca Wells in Broken Bow June 24, 1894. She is a native of Canada, daughter of William and Elizabeth (Bradford) Wells. Her family came to Custer county from LaSalle county, Illinois, about 1891. Her father died February 13, 1895, and her mother January 21, 1908, the former in Custer county, and the latter in Omaha. Three children have been born to Mr. and Mrs. Ross: Raymond L., Leonia Fay and Thelma Irene. The Ross family are one of the most prominent in Custer county and have a high standing in various circles. The old home place is one of the landmarks of the region, but now has modem improvements and conveniences. It is very pleasantly located and surrounded by trees set out by Mr. Ross, some of which are three feet through. He well remembers his early boyhood days when his family, like others in the neighborhood, had to endure many hardships and privations. He is a prosperous and successful farmer and stockman and is recognized as a progressive, useful citizen. In polities he is independent of party lines, voting, for the candidate he considers best fitted for the office. * This picture did not appear in the book. Among the early settlers of Wayne county, Nebraska, who have been largely instrumental in the growth of the commercial interests of that region, a prominent place is given the gentleman whose name heads this article. For about forty years, he has been a resident of the United States, and has always been found ready to further the interests of the community where he has made his home for twenty-seven years. He lives on section thirty-five, Hunter precinct, where he has built up a valuable estate through his industry and good management. Mr. Bichel is a native of Germany, and was born in the Province of Schleswig, Holstein, December 15, 1852. He was the son of Fred and Katie Bichel, the father being the proprietor of a tailor shop and clothing store in a small village. Our subscriber received his school education in Germany, and afterwards helped his parents, until 1871. About this time, Mr. Bichel decided that America offered a better chance for an energetic young man than was to be had in the old country. So in that year, he left his native land on the steamship "Westphalia," which plied between Hamburg and New York City. He came at once to the west, and for thirteen years remained in Mills county, Iowa, when he rented land. In 1881 he came to Wayne county, Nebraska, where he had the year before bought a farm of one hundred and sixty acres, which has been his home ever since. He has made many improvements to the place which have greatly enhanced its value. His pioneer days were not without discouragements, as he suffered the usual hardships and discomforts, with a few extra losses to make the measure even. January 12, 1888, he lost considerable stock in the severe blizzard. Every obstacle encountered, and every loss met, has only made him the more determined to succeed. He has persevered in the face of misfortune, and has now attained his reward in a comfortable, pleasant home, where he can spend a peaceful old age surrounded by friends and family. He owns now two hundred and forty acres of land. November 10, 1881, Mr. Bichel married Bertha Cristen, who was born in the same province in Germany as Mr. Bichel, and with her sister came to the United States the year of her marriage. Mr. and Mrs. Bichel are the parents of twelve children, eight of whom are living. Those living are Ernest, Annie, Adolph, Clara, Frieda, Helen, Albert and Carl. The others died in infancy. Mr. and Mrs. Bichel are members of the German Lutheran church at Wayne, and Mr. Bichel is a republican. Joseph Phelps, whose biography forms an interesting page in the history of the early period of Nebraska, is a resident of Merrick county, Nebraska, where he has resided for the past forty-two years. His present home is one mile east of Central City, where he resided thirty-three years. His original homestead is situated two miles west of the same city. Joseph Phelps was born in Pennsylvania March 22, 1840, and was third of four children in the family of Bela and Henrietta (Swerly) Phelps, who had three sons and one daughter. Bela Phelps and wife were natives of New York state. About 1843 the Phelps family moved to Henry county, Illinois, where later they were known as pioneers of that county, and where our subject, Joseph L. Phelps, grew up to his young manhood days. The mother of Mr. Phelps died in Henry county, Illinois, shortly after her arrival there. Mr. Phelps enlisted in Company C, Ninth Illinois Cavalry, September 10, 1861, and went through Missouri and Arkansas with Curtis' army in the spring of 1862. He received arms at Pilot Knob, Missouri, and the first stop was at Jacksonport, Arkansas, where he was posted during the months of May and June patrolling Caiche Swamps and White river country, going into the first engagement at this point; then engaging in battle at Orchard Ridge July 7th, then on to Helena, Arkansas, arriving there July 14th, where the regiment remained three or four months and during this time had numerous small engagements and skirmishes; and then to Memphis, Tennessee, where they first established post at Germantown, and patrolled the railroad during the summer months, having numerous skirmishes with the rebel forces, and went out on several expeditions. During the months above mentioned Mr. Phelps was with General Washburn destroying the track of the Mississippi and Tennessee railroad, and was with the overland force of General McClernand's White river expedition; and on the skirmish line out of Germantown during the months of June, July, and August, going into Tennessee on scout duty in August. Mr. Phelps was in active service during the war and has an honorable war record. He was mustered out at Springfield, Illinois, in November, 1864, when he returned to Geneseo, that state, andwent back to the farm. On January 14, 1867, Mr. Phelps was joined in wedlock to Miss Amelia Baker, at Genesco, Illinois, at the home of her sister. Mr. and Mrs. Phelps have had three children born to them one of whom is living: Ida, who is married to John Willhoft, has five children and lives five miles north of Central City, Nebraska. In June, 1868, Mr. Phelps came overland from Henry county, Illinois, to Lone Tree, Nebraska, where they pre-empted land and later on, upon passage of the homestead act, took up a homestead which is still owned by our subject and is located two miles west of Central City. Mrs. Phelps joined her husband in the fall of 1868.
wife were on Prairie Island south of Lone Tree station for the purpose of getting out wood, when they had a narrow escape from death by the indians. At this time only Indians occupied this island who had been of a friendly nature. But just prior to their removal to the Pawnee reservation at Genoa the Indians had gone out on a hunting trip, had stolen some stock, and seven or eight had been killed by the soldiers, and this caused a disturbance amongst the tribe on Prairie Island, which fact Mr. and Mrs. Phelps did not learn of until almost too late. Mr. and Mrs. Phelps are of the few old settlers now residing in Merrick county who still own the original homestead. They came to Nebraska before its statehood days, having passed through the different phases of early settler life, remembering the Indian days and enduring the hardships of the pioneer, assisting in building up a growing country. They have many friends, and hold the respect and esteem of all who know them. Mr. and Mrs. Phelps now reside in their pleasant home on their one hundred and sixty acre farm one mile east of Central City which was originally homesteaded by Elnathan Phelps, who was killed on his land during the cyclone of 1871, which picked him up and threw him in a cottonwood tree, where he was found dead. This man was not a relative of our subject. In the fall of 1883 Mr. Phelps' father and stepmother came to visit him and in the spring of 1884, his half-brothers, James and William, came to Merrick county to reside, when the old folks then went to live with their son James, and about 1888 James moved to Seward county, Nebraska. William, of whom a personal sketch appears on another page of this volume remained in Merrick county, where he still resides. Thus ends the biography of a long and useful life, ripe in years and deeds, and we trust Mr. Phelps' life be prolonged many years to come. Of the residents of Spencer, few have lived longer in the town than her well-known citizen, Jack Mott, who has resided here continuously since his arrival in 1892, excepting a few months,when he was absent disposing of a stock of goods he had secured in a trade, followed by a three months visit in Oklahoma. Other than this short time, his legal residence has been in the city on the hill. Mr. Mott was born in Waukegan, Illinois, May 8, 1859, a son of Elias E. and Kiziah (Cady) Mott. The parents, at the ages of eighty-six and sixty-seven, reside in Canby, Oregon. They are both natives of the state of New York. They celebrated their golden wedding, in 1908, on May 11, a pleasure that is vouchsafed to few couples. From Waukegan they moved to Rockford, Iowa, in the spring of 1860, landing there May 16; they lived there until the fall of 1864, and then moved to a farm five miles south of town. In 1869 they sold and moved to another farm on Coldwater creek, nineteen miles from Rockford where they resided eleven years, when they traded for a farm fifteen miles further away, near Clarksville. During this time the father took a trip to California, but finding no place to suit him better, returned. After eight years on this farm they sold and lived for a year in Butler Center, and then bought a farm near on which they resided for a year before selling and returning to Clarksville. Here he bought twenty acres on which he resided but a short time before migrating to Oregon, December 25, 1890, and has made that his abiding place ever since. From boyhood, Jack Mott was energetic and self-reliant and while yet in his teens engaged in trapping, earning enough that way one winter to buy a span of colts and several other animals, and the following winter enough to buy forty acres of good land. This he later traded for a fifty-one acre tract adjoining his father's place. By trading in this way, in which be was very shrewd, he had accumulated property valued at four thousand dollars by the time be was married, at the age of twenty-seven. Remaining under the parental roof until his marriage, Mr. Mott then set up a home for himself and farmed for two years, engaging in carpentry at times. Through successive drouths Hr. Mott lost everything be owned but a team and wagon, a cow and a few pigs. He moved to Clarksville and although he was the thirteenth to enter the business of draying in the town, he made it profitable from the start and began trading in property. He soon had a good home, and at the end of three and one-half years had again accumulated quite a valuable selection of property in town lots and buildings. A large frame house that stood on ground the owner desired to improve with a much larger one, Mr. Mott bought for almost nothing and removed to a whole block he purchased for the purpose. Thus, at a comparatively small outlay he had a very valuable piece of property. In February, 1892, Mr. Mott sold his Clarksville place and came to Boyd county, settling in Spencer when there were only a few here ahead of him. Here he has resided since, excepting about eight months in 1906, when he spent five months at Union disposing of a stock for which he had traded; after which be spent three months visiting in Oklahoma. and two hundred dollars, sold his equity for six hundred dollars, and sought other investment. He secured one hundred and seven lots in town at a very low figure, which he held until they could be sold for five times their cost price, thus realizing a heavy increase in his capital. Among other property, he secured in a trade forty acres near Springfield, Missouri, which is valued at thirty-five dollars per acre, and although oportunity [sic] to sell is offered, he prefers to hold. Besides carpentry, Mr. Mott understands plastering and paperhanging, at both of which trades he finds employment the greater part of the year. Contracts take him into a far field, sometimes as far as Gregory, South Dakota. Mr. Mott was married at Greene, Iowa, May 29, 1886, to Miss Effie Davis, a native of Iowa, a daughter of Moses and Nancy J. (Hall) Davis. Three children constitute their family. They are: Letty, wife of Alfred Allen, of Spencer; William, who is employed with his father; and Amy. William, who graduated from high school in the class of 1910, is the first to complete the entire course in the Spencer schools. So high was his grade that he is accredited to any state institution with a hundred credits to his account, besides free tuition. Mr. Mott is generally democratic in politics, though he has at times voted the prohibition ticket. He has been a member of the Odd Fellows since 1889. Mr. Mott has encountered many severe blizzard without flinching, and has fought prairie fires in Iowa as well as in Nebraska. He has been an extensive traveler, his migrations extending as far as Oklahoma and Texas to the south and to Oregon on the west. Many of his trips have been made on his bicycle, and in this way he has been enabled to see the country more intimately than he could have done had he gone by rail. Mr. Mott is an entertaining talker, remembering the detail of the many incidents he interestingly relates, and has a good memory for dates and circumstances. He stands well in his community, deserving the highly commendatory reputation his neighbors and colleagues accord him. It would be impossible to give a sketch of the early history of the northeastern part of Nebraska, without including considerable of the Schultze Family, one of whom, Fritz, is the subject of a sketch apearing elsewhere in this volume. His brother Paul, the subject of this article, is equally prominent and well known here, and has contributed in an equal measure to the prosperity now enjoyed by the people of this community. Like his brother, Mr. Paul Schultze was born in Germany, in 1862. When the family emigrated to America, in 1869, he was old enough to remember a few incidents of the trip over, while Fritz was a mere infant at the time. As has been related in a preceding sketch, the family came at once to Stanton county, Nebraska, where they took up a homestead on section nineteen. Their first dwelling was a dug-out, which served as a home for the family for about fifteen years. Our subscriber can tell many interesting stories of those pioneer days, which now seem to be so far back of us. Hardships innumerable have been contended with, and there were many of the early settlers who gave up and went back to their comfortable homes in the east. Those of the valiant heart and courage, those who possessed indomitable perseverance, have long since received their reward. In 1890, Mr. Schultze was united in marriage to Miss Martha Newman, of which union three children have been born. They are named as follows: Minnie, Sarah, and William. The name of Schultze has, since the maturing of the state of Nebraska, been coupled with the progressive affairs in the communities in which they have lived. To those men of perseverance and strong determination who came to Nebraska when it was undeveloped as an agricultural and commercial region, the present prosperity is due. Prominent among the early settlers of Antelope county who have been closely identified with its progress and who has gained an enviable reputation as a citizen, may be mentioned John Hamilton, a prosperous and successful farmer of Royal township. Mr. Hamilton is a native of Seneca county, Ohio, where he was born in September, 1856, and is the son of Thomas and Sarah (Williams) Hamilton. Mr. Hamilton's father served in the Civil war, enlisting in Company --, Forty-seventh Indiana Infantry, and participated in the battle of Lookout mountain, and marched through Alabama, Tennessee, New Orleans, North Carolina, and South Carolina; and also participated in the battle of Gettysburg, Richmond, and Antietam. In June, 1867, Mr. Hamilton moved to Illinois where he remained twelve years, then going to Cass county, Nebraska, driving the entire distance, where he rented a farm for four years. He then came to Antelope county, Nebraska, taking up a pre-emption claim in section eighteen, township twenty-four, range seven, where he resided seven years, then taking up a homestead of eighty acres in section twenty-one, township twenty-seven, range seven, where he still resides and has a well-improved farm called the "Happy Holler." November 26, 1884, Mr. Hamilton was married to Miss Sarah Stockton, and eight children blessed this union: Charles, Stella, Daniel, Elsie, Murvin, Stacey, William, and Willis, the last two being twins. In 1892 Mrs. Hamilton died, survived by her husband and children. Mr. Hamilton has experienced all the trials and hardships incident to pioneer life. At times everything seemed to go against him. At one time the hot winds destroyed his crops and at other times the drouth caused heavy losses. In 1889, while Mr. Hamilton was attending a funeral, a prairie fire broke out, doing immense damage. Fortunately for Mr. Hamilton, however, he escaped without loss. March 19, 1896, Mr. Hamilton again married, this time to Almyra Ashford, this marriage taking place in Missouri, where Miss Ashford and her parents resided and were old settlers in that state. They later sold out and moved to Oklahoma, but returned to Missouri after one year. Mr. and Mrs. Hamilton live in their pleasant home and enjoy the respect and friendship of a great many friends. Politically, Mr. Hamilton is independent. He is a member of the United Brethren church, Ancient Order of United Workmen, and Independent Order of Odd Fellows. Jacob Walter, a substantial and representative citizen of Custer county, who has lived on his homestead there since 1883, is a native of Harrison county, Indiana, born July 31, 1860, the eleventh child of John and Catherine Walter, and the youngest of their six sons. He has two sisters, now living in Custer county, Mrs. George McRae, and Mrs. Walter Bence, whose husbands belong to pioneer families of the region, but of the others his brothers and sisters are scattered in various states, Kentucky, Iowa, California, and Indiana. The parents are deceased. Mr. Walter was reared on a farm in Indiana and received the usual educational advantages of a farmer's son. About his twenty-second year he went to Kentucky and spent a year there and in May, 1883, he came to Custer county, with his brother-inlaw, George McRae, and family. Upon coming to Custer county took a homestead comprising the southeast quarter of section fifteen, township seventeen, range nineteen, which has been his home continuously since that time. He now has two hundred and forty acres of land in this section, besides one hundred and sixty acres in another section. He has a well-equipped and improved grain and stock farm and is one of the original homesteaders of his part of the county. He has served in various local offices, such as a member of the township board, school board, and in other capacities. He is a man of sterling worth, much interested in the welfare and development of his county and state, and is popular among his many friends. On April 14, 1904, Mr. Walter married Minnie Cudmore, daughter of William and Sarah Cudmore, their union being celebrated at Broken Bow. Three children have blessed their union: Ada Bernice, John Clarice and Cecil Gertrude. Mrs. Walter was born in 1873 and has one sister living in Custer county, Mrs. Peter Pederson, whose husband is one of the pioneers of the region. Her parents came to the county in an early day and were prominent among the pioneers. Lucian McCandless, a prosperous and business man of Broken Bow, Nebraska, is one of the earliest settlers in his part of the state. He was born in McDonough county, Illinois, June 25, 1854, next to the youngest of the four children of Samuel H. and Delia (Reed) McCandless, the father a native of Pennsylvania, and of Scotch extraction, and the mother a native of New York. He died in Illinois in January, 1861, and she died in York, Nebraska, in 1900. One son, William R., now lives in York, Nebraska, and two daughters are deceased. Mr. McCandless grew to manhood on his father's farm in Illinois and obtained his elementary education in the public schools, later attending Macomb academy. 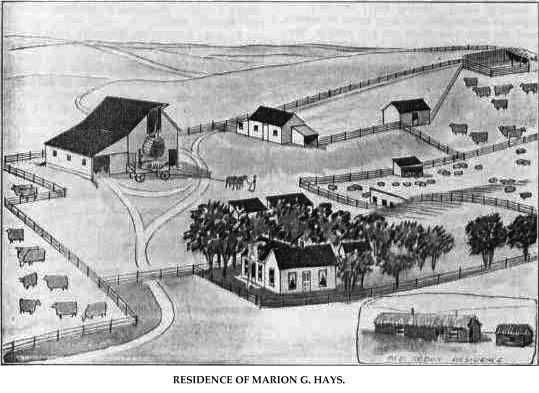 He engaged in farming for himself as a young man, and in February, 1874, seeking for larger opportunities for securing a home of his own, located in York county, Nebraska, where he purchased railroad land. On September 12, 1878, Mr., McCandless married Amanda Emma Gandy, at the home of her parents in York county. She was born in Davis county, Iowa, a daughter of Amos W. and Mary E. (Phelps) Gandy, and came to York county in 1870.